When I first began blogging, I didn’t really know what I would put on my blog or where it would take me. Actually, I was forced (well maybe required is a better word) to make a blog for my advertising media class last fall and figured I love food, music, photos, etc. so why not focus on my senses. Almost a year later I am at a point that I would have never imagined. I am completely submerged in the blogging universe and loving it! When I tell people that I am a blogger they are always a little uneasy, but then when I tell them I am a FOOD blogger they always seem so intrigued. I am so excited about all of the opportunities I have been given because of my blog, although I must say that the next few weeks are kind of filled with different blogging opportunites, I hope you enjoy them too! I am not in the blogging world for the free gifts from companies, but I am all for supporting great companies, young or old. 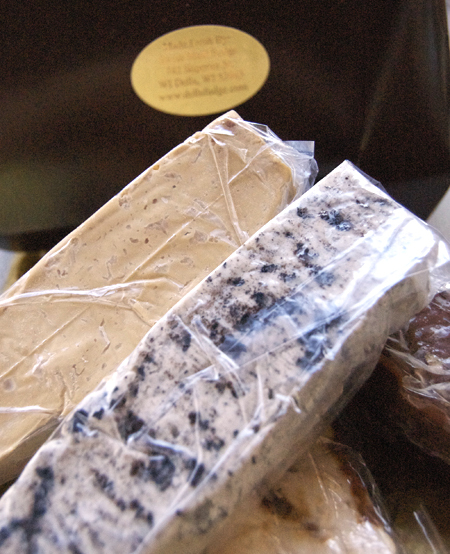 When I was approached by Swiss Maid fudge about hosting a pairing party with fudge of course I was excited! Who wouldn’t want to have a party all about fudge?! 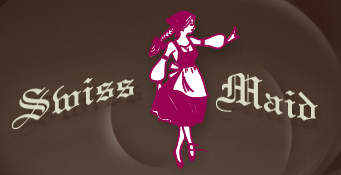 Swiss Maid is a great little fudge company based out of Wisconsin. They have all sorts of fudges that will blow your mind, it was hard to save them for the party! Our friends wanted to wear bowties and jackets for the party, but it turns out nobody really owns those things… So instead we dressed the party down, hung out in the kitchen and on the porch and ate way too many sweets for one day. As an appetizer for the party, I made a caramel apple dip with the vanilla-caramel fudge. Dipping green apples in this dip really tasted like you were eating a caramel apple, without the mess. 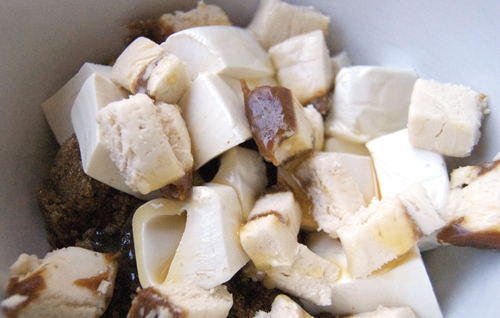 Combine cream cheese, butterscotch, sugar, vanilla and fudge in a large bowl and beat with a hand mixer until smooth and creamy (about 3 minutes). 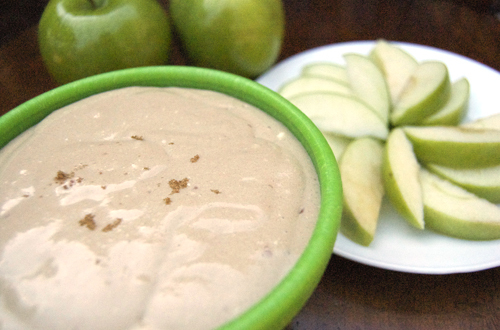 Dip with apples and enjoy! After devowering the caramel apple dip, I cooked up a “main course”, if you want to call it that since it was another sweet treat. 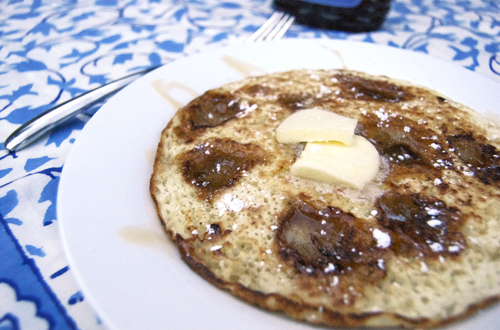 For the entree I made maple buttermilk pancakes with the Swiss Maid maple fudge. It was wild this fudge actually tasted like a delicious maple syrup! If you have ever wondered how to make your own “instant” pancakes without the bag of mix, this recipe from Food Network will show you how. Combine pancake mix, eggs, buttermilk and melted butter in a large bowl and beat until combined (there should still be some chunks). Heat a large skillet over medium heat and grease with butter. Pour ¼ cup of mix per pancake and place fudge slices throughout each. Flip the pancakes and finish cooking (about 1-2 more minutes). As if that wasn’t enough, I had saved the best for last. Earlier that day I made a banana split ice cream cake for dessert that had been hiding form the sweltering heat in the freezer for four hours. I got this idea from one of my favorite celebrity chefs, Paula Deen- so you know it had to be good! Note to self, do not like to deal with ice cream in a boiling kitchen in the middle of the day- it melts too quickly! But, it was worth it because this dessert was amazing. Place half of ice-cream sandwiches evenly over bottom of a medium casserole dish, cutting sandwiches to fit. 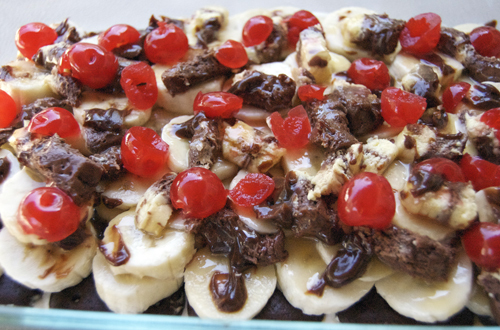 Layer with banana slices, then fudge pieces over the bananas. Top with 1/2 of the cherries and 1/2 of the toffee bits, then pour butterscotch evenly on top. 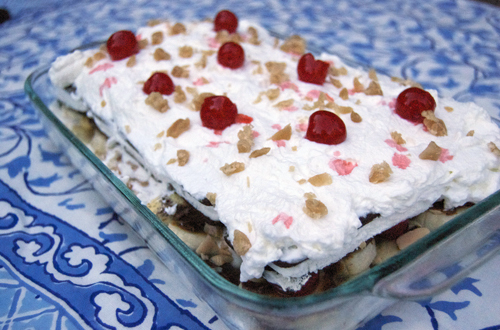 Cover with the remaining ice cream sandwiches and spread whipped cream over the top and sprinkle with remaining toffee bits and cherries. Cover and freeze for at least 4 hours. Cut into squares to serve. What makes all this even better? We washed it all down with some tasty fudge-topped white Russians, then very quickly fell into sugar comas- just kidding, but it was close. 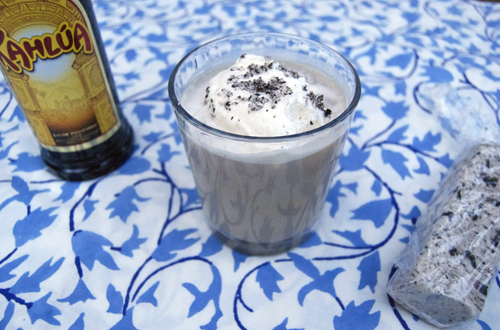 Combine 2 oz vodka and 1 oz coffee liqour in each glass. Top with cream and shaved fudge. I want to give a big thanks to Swiss Maid fudge for allowing me to participate in one of their pairing parties, it was a great way to escape the heat and have some fun. If you feel like you are melting away this summer, I suggest you get yourself some Swiss Maid fudge and have your own pairing party! Disclaimer: This post was sponsored by Swiss Maid Fudge. I was sent a free fudge package to host my party. Sounds fun! I love supporting small, independent businesses. Fudge party, what fun that must have been! You had some really creative uses for that fudge and I am sure all involved benefited in their own way. Yum! Have a great weekend. Sounds like fun! Wish I could have come to that party! I couldn’t even begin to pick my favorite from this sweet line up. They all sound and look amazing. Buzzing you! 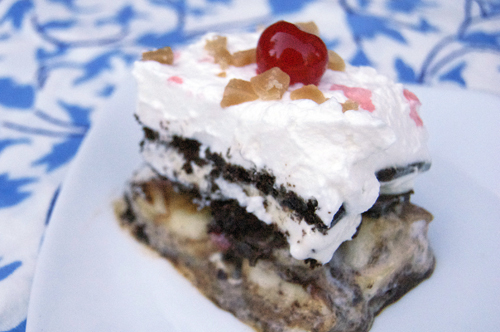 That banana split ice cream cake is making me hungry in a big way. Lovely recipes. So many delicious recipes, I don’t know how to choose! These are come pretty amazing looking recipes! Great use of the fudges! Wow – you made some delicious dishes for your party! Everything looked tasty…I’ll have to check out their site! OMG banana split ice cream cake?!?!? Yes please! buzzed!